Qualification : Must have passed 12th Standard or equivalent from a recognized Board or University. As per Ministry of Human Resource Development Notification No. 44 dated 01.03.1995 published in Gazette of India edition dated 08.04.1995, the Degree obtained through open Universities/Distance Education Mode needs to be recognized by Distance Education Council, IGNOU. Accordingly, unless such Degrees had been recognized for the period when the candidates acquired the relevant qualification, they will not be accepted for the purpose of Educational Qualification. Candidates who have not acquired but will acquire the educational qualification and acquire documentary evidence from the Board/University in support thereof as on 01.08.2015 will also be eligible. 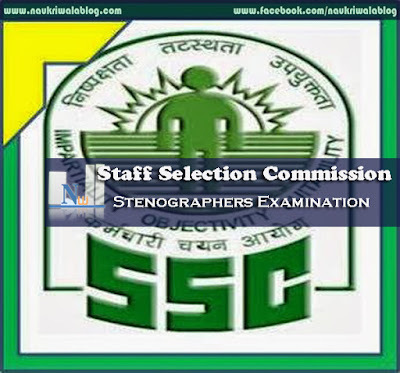 Mode of Selection: Applicant process of selection will be decided on their performance in written test and their skill test in stenography as per conducted by selection panel of SSC. Application Fee: Applicant has to pay amount of Rs.100/- as application fee. Application fee can be paid online by using Debit Card/Credit Card/Net Banking through SBI Bank challan.Women candidates and candidates belonging to Scheduled Caste, Scheduled Tribe and Ex-Servicemen eligible for reservation may not have to pay any kind of application fee. Candidates interested in this job can apply online. Click on Part-I registration to get registered. Then after registration of Part-I kindly click on Part-II registration to complete process. Make the payment done for application fee through online mode. Applicant can also send their prescribed application form on address mention in official link as on 07.09.2015. Opening Date of online registration: 08th Aug 2015. Closing Date of online registration(Part-I): 04th Sept 2015. Closing Date of online registration(Part-II): 07th Sept 2015. Closing Date for receiving off line form: 07th Sept 2015. Written Exam Date: 27th Dec 2015.